Date: Tuesday, 3rd February 1987. Competition: FA Cup Fourth Round. Score: Swindon Town 1 Leeds United 2. Scorers: Swindon Town: Bamber. Leeds United: Quinn (o.g.) Baird. Swindon Town: Digby; Ramsey, Hockaday; Wade (White), Parkin, Calderwood; Jones, Kamara, Quinn, Bamber, Barnard (Coyne). Leeds United: Day, Aspin, Adams; Stiles (Edwards), Ashurst, Ormsby; Ritchie, Sheridan, Pearson, Baird, Rennie. Unused Sub: Swan. Referee: Mr J. Ashworth (Leicester). 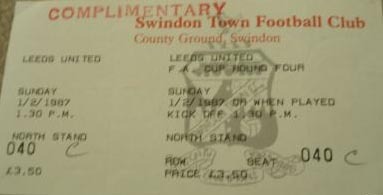 The game had to be re-arranged for a Tuesday night due to fog on the Sunday, the original date for the tie.. Swindon were in-form and running away with the old Third Division and soon pinned United back with their hard running and aggressive tackling. After surviving an intense early barrage, Leeds almost took the lead in the eleventh minute when Andy Ritchie’s shot from an angle beat the goalkeeper but rolled across the face of the goal and past the far post. A minute later it was Swindon who went in front. Leigh Barnard’s corner was headed firmly home by the lanky Dave Bamber. A fine save by Mervyn Day kept out a header from Jimmy Quinn, but the ball ran free to Leigh Barnard, whose low shot was cleared off the line by John Stiles. After those let offs, Leeds regained their composure and forced their first corner and from it came the first Leeds goal. United could count themselves lucky to level the scores in the thirty-first minute when Quinn, back in his own box for the corner, miss-headed the ball past his own keeper, from that corner and against the run of play. The goal took some of the sting out of Swindon, who, despite having loud appeals for a penalty turned down, were unable to stoke up their early fire. United with midfielder John Sheridan watched by Graeme Souness, Manager of Rangers, and Kenny Dalglish, Manager of Liverpool, began to make their superior passing tell as Swindon faded. 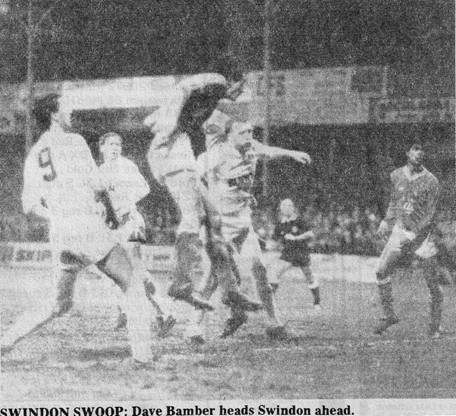 In the fifty-first minute, Ian Baird got above the Swindon defence to score with a deflected header to put United into the lead and in control. But Swindon finished as they had started: In an attacking frenzy. Two substitutes were used in the competition for the first time and Swindon’s pair, Steve White and Peter Coyne, were thrust on in place of Bryan Wade and Leigh Barnard, as Swindon frantically threw everyone forward to grab the equalizer. 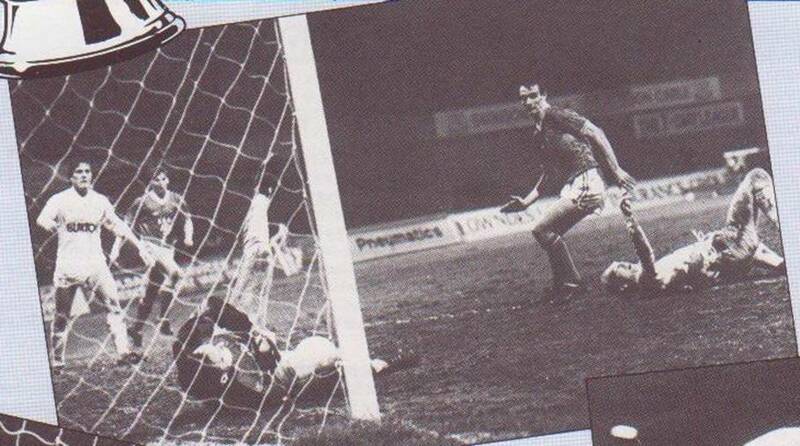 But Mervyn Day kept cool, distinguishing himself once more at the end, finger-tipping a full-blooded drive by Jimmy Quinn over the bar to clinch United’s win. And from the YEP: A classic, raw-boned, saw Leeds United, at one point apparently on a hiding to nothing, go through to the Fifth Round on a night of high drama at the County Ground. The Third Division team got off to an electrifying start, scoring after just twelve minutes and threatened to over-run a teetering Leeds side. But Leeds pulled back courtesy of a goal by John Pearson, and went on to impose themselves more as the second half progressed. The winning goal came in the fifty-first minute. 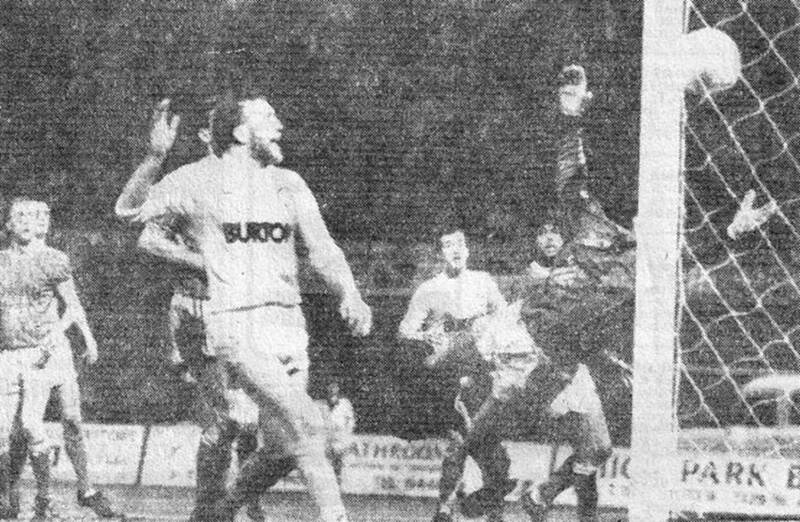 Neil Aspin raced down the right and his cross was met by Ian Baird stooping to head the ball through the legs of anguished goalkeeper Fraser Digby. There were dozens of heart stopping moments before Leeds could celebrate as Swindon, roared on by a capacity crowd went in search of an equaliser. 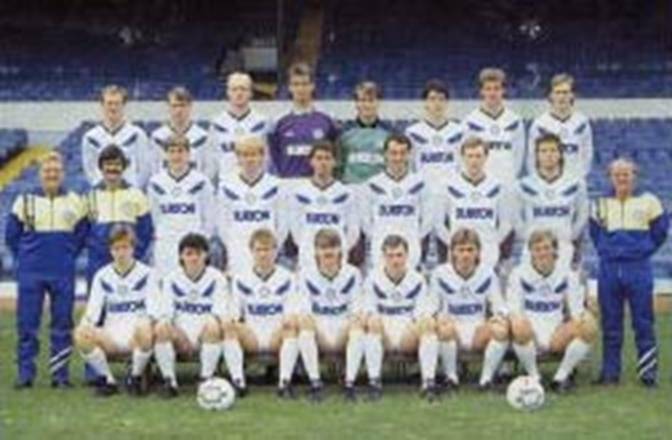 Their front pair of Jimmy Quinn and Dave Bamber constantly threatened to create, ably supported by strong running Chris Kamara and Leigh Barnard but Leeds weathered the storm well. Mervyn Day in goal had a few nervous moments, but he pulled off a great save in the dying seconds tipping a Jimmy Quinn pile-driver over as Swindon reached a crescendo. As Billy Bremner had predicted, it was not a night for delicate flowing football, but John Sheridan produced a gem of skill beating three men in a tight penalty area and getting in a vicious shot which was deflected for a corner. This was the highlight of a performance whish was bound to have caught the attention of the watching Graeme Souness, player-manager of Rangers and Liverpool’s Kenny Dalglish. Swindon’s best chance of victory probably disappeared when they failed to capitalise on a tremendous start, which saw them win a corner in the first twenty seconds. Jimmy Quinn tested Mervyn Day with a rising shot and Swindon forced five corners in the first eight minutes. Mervyn Day was fortunate when a drive from Mark Jones cannoned off his body and was deflected wide. Ritchie had a chance to settle Leeds nerves after nine minutes when John Sheridan produced a defence-splitting pass to leave him unmarked on the right. The striker took the ball to the edge of the box, but as Fraser Digby came out, his shot bobbled and ended up well wide. That looked like a costly miss when Swindon went ahead after twelve minutes. Leigh Barnard’s shot was well parried by Mervyn Day for a corner which Barnard took himself. 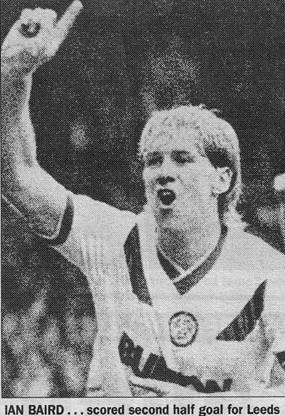 With Leeds in disarray David Bamber was allowed a free header and he made no mistake from six yards. 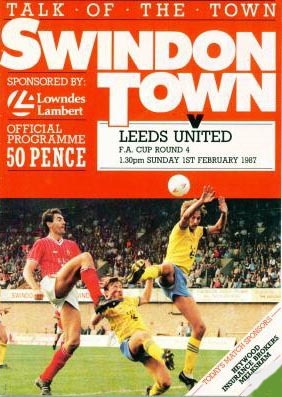 The red shirts of Swindon swarmed everywhere and there was a remarkable double let off for Leeds when Jimmy Quinn met Mark Jones’ cross with a full-blooded header which Mervyn Day parried. The ball seemed to be creeping over the line but John Stiles managed to hook it away. Leeds were simply being over-run in all areas, then just when the way back seemed long and arduous John Pearson, with his first goal since his £80,000 transfer from Charlton Athletic the previous month, grabbed a thirtieth minute equaliser. Leeds won their first corner. John Sheridan floated it to the near post, where the slightest flick from the head of Pearson sent the ball beyond Fraser Digby and gently into the right hand corner of the net. On that foundation a grateful Leeds began their revival, although they still had to hold out until half-time and they were grateful on more than one occasion for the cool head of John Sheridan, who always found time and space on a night of frenzied activity. Barnett, Dean Casserly, Adrian Viveash . Nigel Thompson, David Rennie, Brendan Ormsby, Ronnie Robinson, Billy Bremner (Manager).